Rohit scored a magnificent century at the County Ground in Bristol in the third T20I. Rohit Sharma is currently the owner of a number of records in limited-overs cricket. The Maharashtra-born cricketer has three double-centuries in ODI cricket, the most by any batsman in the 50-over format. He got the nickname of ‘Hitman’ following his superlative knock against Australia at the M Chinnaswamy Stadium in Bangalore. Rohit followed it up with a couple of more 200s in Kolkata and Mohali respectively. He boasts of three T20I tons as well, the last of which came against England at the County Ground in Bristol. He is at par with Colin Munro, the New Zealand batsman, who has as many centuries in the shortest format. However, the 31-year old isn’t concerned about his personal milestones, which he believes will come until one keeps playing the sport. “We had lost the second game and it was important to make sure we won the decider. My focus was on taking India to the win and making sure we built enough partnerships. 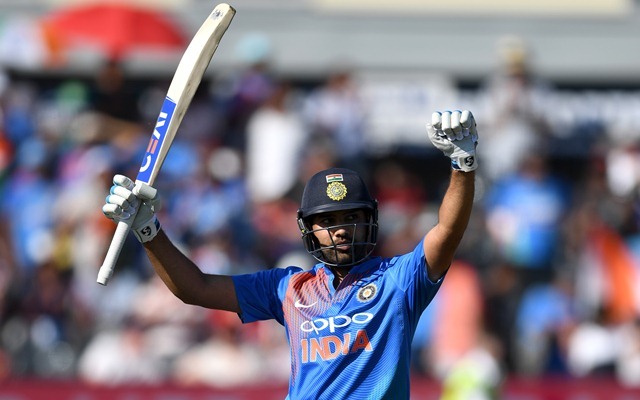 Personal milestones will keep coming as long as you are playing,” Rohit told to Dinesh Karthik in a video posted by the Board of Control for Cricket in India (BCCI) on their website. The Indian top order was fantastic in the T20I series against England, which was won by the Men in Blue by 2-1. Earlier in Ireland, Rohit had the opportunity to score his third T20I ton but he couldn’t and was cleaned up by Peter Chase for 97 runs. He also talked about the team’s approach while batting. “Since we were batting first, our idea was to get as many runs on the board as possible, which is why I was going for the shots. But it was unfortunate that I could not complete the ton. We always try to ensure that there is one set batsman at the crease through the innings, or at least a major part of it. Last time it was KL Rahul’s chance and he scored a brilliant century. This time the onus was on me,” the right-handed batsman added.